Buy Puerto Rico and PriceWatch, Buy this board game at the Lowest Price. 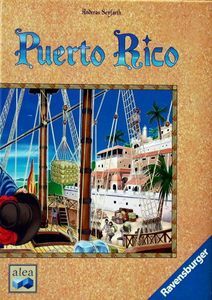 Winner of the Deutscher SpielePreis award in 2002, Puerto Rico is truly a gamer's game. It is based on the premise of colonizing the island of tropical breezes, Puerto Rico. Each player attempts to raise and export the most valuable crops while erecting buildings to enhance his or her ability to produce and sell goods. Players also select a role, with unique attributes and abilities, to play on each round. Because the game is so rich in options, there are a huge number of different strategies that can lead to victory. As with many of the best games on the market, Puerto Rico keeps all players involved on every turn. The game plays equally well with three, four, or five players. Although the basic game play is not too complex, the multitude of choices and the long-lasting impact of those choices make this game appeal most strongly to seasoned gamers. Puerto Rico's balanced design usually leaves the outcome of the game in question up to the final round, when the losing players all wish they could have had just one more round to take the lead. Puerto Rico is an excellent strategy game, and I give it my highest recommendation.